The text of this manuscript concerns the characteristics of different kinds of animals, plants and stones. It seems to have been made for a librarian of the Benedictine abbey at Rochester, and its artist also worked on a Psalter probably made for a London patron; he therefore probably moved around Southeast England. The illumination was left unfinished, however, so it may be that the librarian ran out of money, or that the artist was called away to another project. 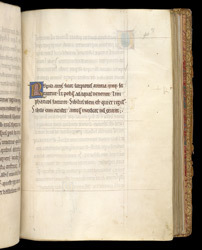 The decoration of this volume was never completed: most of the page has been left for miniatures. In the left margin can be seen the guide letter 'R' in both ink and leadpoint.